First off I have to say that I enjoyed creating the 2025 room, I felt it stretched my imagination and gave an insight into what may be to come. However, the textures created were not exactly vast – and this is despite my hope that the future may see an upsurge in the use of patterns and textures in the home. However, the obvious change is for the curtaining but this used simply a picture of a holiday scene. The sofa, however, used two new textures but here I am my own worst enemy because I was always taught to be economical and reuse items where I could and so both of these textures have been seen before. However, I have included them again. The sofa, incidentally, was a new model created for this room with it’s nice metal feet – the same design as is used for the table. The table itself has a large, plastic semi-transparent top that uses a simple repetitive pattern that has a different bump image to create variety. Note the legs which are made in copper material. To create four swatches this time I have included a swatch of the rug. This is a pattern made with Filter Forge of recycled paper. I learned a long time ago that it is not important what something is called; what is important is what it does and what you can create with it. 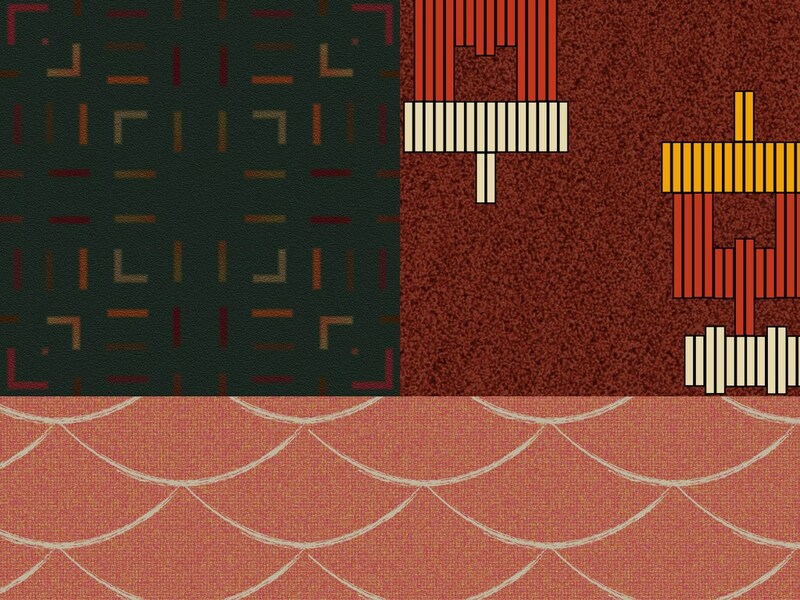 The image is used along with a bump image of a carpet to create the texture. This brings me to the blue colour used on the sideboard. I envisaged this as a cherished piece of furniture that had been given a contemporary makeover and repainted. Let’s say, in the middle years of the next decade, there is a trend for a blue colour. Painted in blue and with a shiny finish it looks very new and modern and the reflections help to draw the eye. I would like to say that I created this shiny colour but, sadly, I cheated! The model and the render were made in Cinema 4D and the surface is the blue car paint that they supply as a sample! However, it looks very much the part and – OK, I have to be honest with you – it was better than the surface I originally made. I am, I think, a better pattern designer than a 3D artist! So there we are – four textures and one paint used in the model which go some way in helping to create the scene and the ambiance. 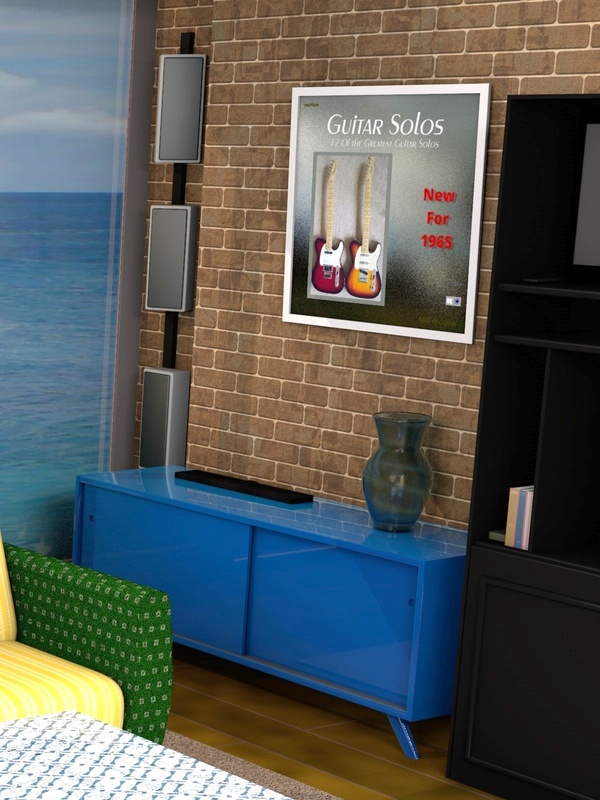 Finally, in case you are wondering, the picture on the brick wall – Guitar Solos – was one that I made for some album covers quite some time ago and, once again, it is being reused! To be honest, take away the curtains, this is a room that could almost be created with what is available today. On the Flickr page is the composite above and a detail from the image at the rendering resolution of the blue media unit and image above. The Flickr page is here. It’s 2025 today and now we’re all a full ten years older and maybe wiser – oh! 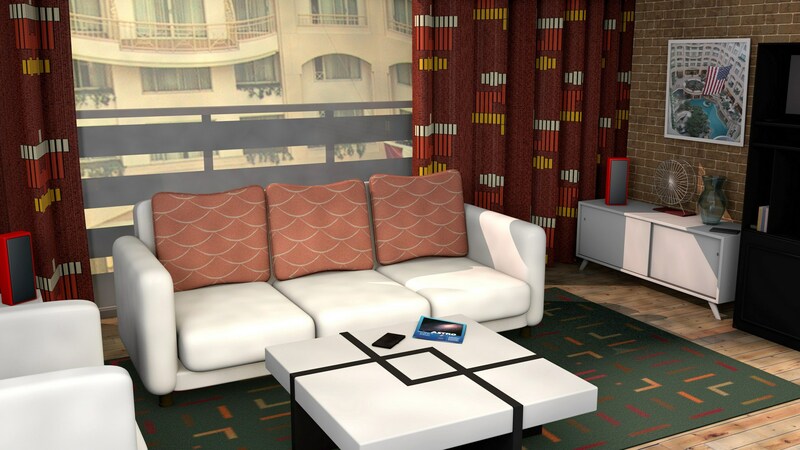 So what will our apartment room look like a decade from now? OK, so this is just a bit of fun, no one can look that far into the future with any degree of certainty but, hey, why not let’s have a go, we might get some ideas and learn something! First off, what has happened to the nice curtains that we closed at night? Curtaining might well become available in smart fabric that can be used as a giant TV type screen. These curtains are just lengths of clear fabric that show an image. Currently they are showing pictures taken of the owners recently holiday to somewhere hot and exotic. The image is slightly transparent to allow light and the outside to filter though but at night the transparency can disappear to show the images in their full glory. Of course, we’re not limited to streamed pics and the curtains can show images from the internet or even – God forbid – TV programs from anywhere in the world! Sounds too good to be true? I think this sort of technology is not that far away. Look back ten years in your own house – ten years ago we have just moved here and pics of the time show that the main room has not changed all that much. For the apartment I began with some very space-age furniture and then realised that this probably would not happen; furniture is expensive and not that frequently replaced. However you will see that some items have had a nice repaint in the new shiny blue colour that is sweeping homes in the country! The picture on the wall is, in fact, showing the sounds that are coming from the new speaker system controlled by the small remote on the table and we have programmed in the next few albums already and their covers will appear as the album plays. OK, so much of this is just fun but maybe this is not so far removed from what we will have as we progress toward 2030. For my part I have to say that I am looking forward to it (and I hope that at least the curtain part comes true!). I will do a post about the textures hopefully tomorrow or over the weekend. As always, there is a larger version of this image is on my Flickr page which is here. This time there are just three more modern textures created for the up to date version of the room posted yesterday. The first one of these is the texture for the rug which I decided to keep in the room. This is a simple texture created with the excellent Filter Forge program using the Ruggestry filter by DreamWarrior. The colour is simple and unobtrusive and the pattern is designed to look like ‘cut-outs’ and so draw the eye. I kept the colour dark to help accentuate the other furnishings in the room. The remaining two patterns for the curtains and the cushions began life as Illustrator patterns created by me as designs for soft furnishings. The curtains are a lovely patterns called ‘two-up’ which I have used extensively while the cushions are a ‘fishscale’. I kept the cushions deliberatly low key so as not to dominate and I refrained from making them a saturated red so that they did not draw the eye too much. Following on from yesterday, I have given some thought to a version of the room ten years hence and I might try to do that today or tomorrow if time permits. The other use for the room and the textures is to create a similar scene in Daz Studio but this time with people. Of course, Daz now has the Iray renderer which I am anxious to try out. A larger version is on the Flickr page here. 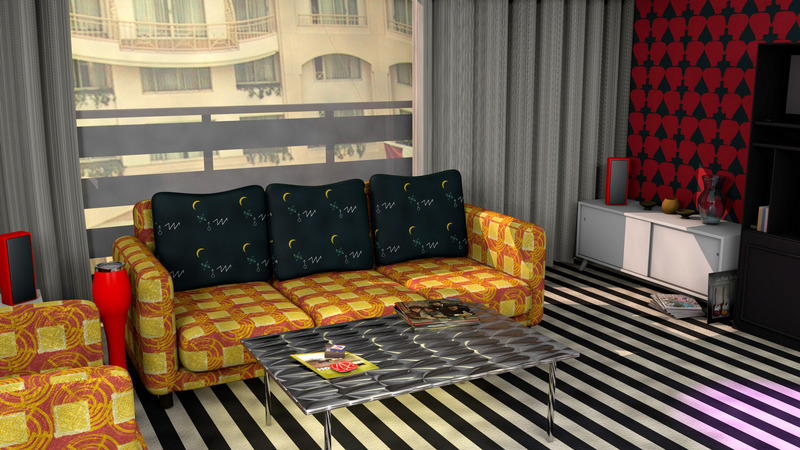 We’re moving now to a more modern look for the apartment room, the sort of look that might be in fashion at the moment. The room structure is the same, as is the furnishings and curtains along with some of the furniture. What is different are the textures applied to these articles. To make the room look a little newer one of the walls has been scraped back to reveal the brickwork and a picture has been added. The colours are still muted to an extent but the patterns are bigger and slightly bolder. Much more courageous colour and texture variations could be attempted but then the room loses the look of a real apartment room and looks more like a showroom creation which is not the effect that I wanted. The idea is to show what a real room could feel like with a modern makeover. This takes this room from mid-century up to the present day and perhaps, if I get time, I might give you an idea of how the room could look ten years from now in the years preceding the 2030s. A larger version of this image is on my Flickr page which is here. 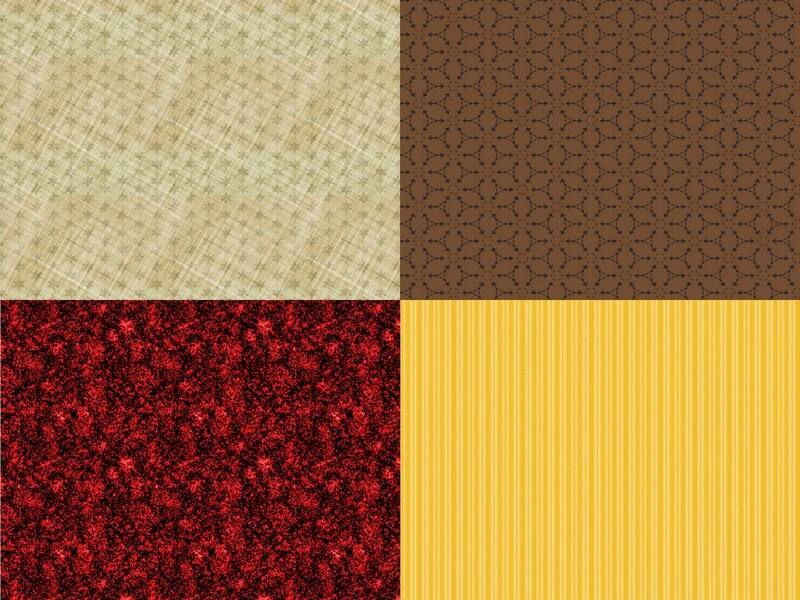 These are four of the late 1960s or early 1970s textures that I created in order to use on the 70s room posted yesterday. The top left is the carpet. Black and white are strong colours and in a way this typifies the mood of that period: it was a time of strength and of experimentation with new colour schemes and new materials. Black and white where also finding a use in the innovative and original modern art that was appearing and its use as a pattern marked the consumer out as modern in outlook and ideas. The top right is a rather simplistic black pattern used for the cushions. Again, the use of black was a trend going against convention and one that appealed to the modern, design conscious customer. Bottom left is a lovely pattern called ‘Face To Face’ that can used at a variety of scales and is used on the walls as a wall covering. Here is offers a constrast of (again) strong colours that lead nicely into the plain curtaining. 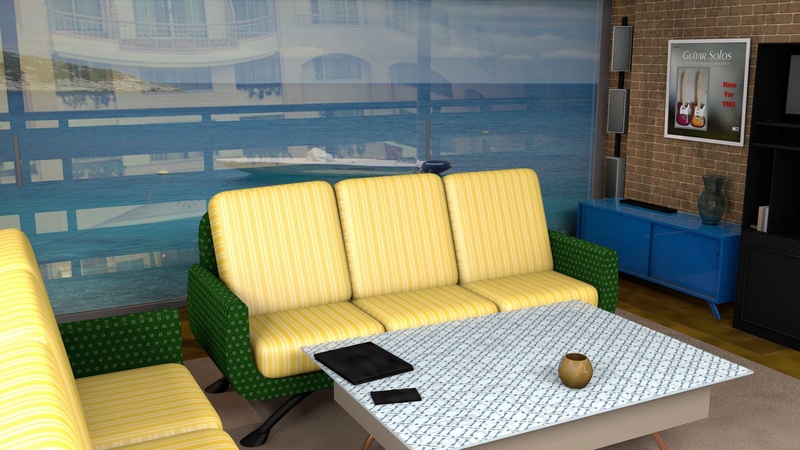 Bottom right is a very 1970s style pattern that is used at a large scale for the sofa. It is a simple pattern but one that can be used at a variety of scales for anything from curtaining to cushions. As promised yesterday, this is a very different looking room based more on the late 1960s or perhaps the early 1970s. Yes it has a very different look, doesn’t it, and did I hear you say that it’s a bit busy with patterns? For modern taste it is and, in fact, I even had to calm down the curtains to produce this image. 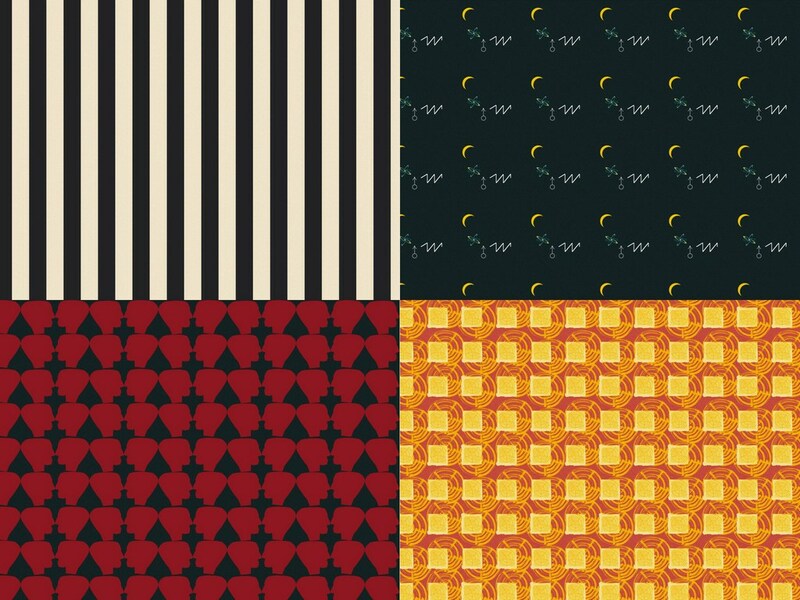 The 1960s and then the 70s was a time when so many patterns appeared and people felt compelled to use as many of them as possible in the same room! The mood was excitement at the twists and turns that design was taking and there was a feeling that they were all part of an experiment in modern living. In fact, the product of all this was a clean, clear and somewhat colourful style that helped to usher in the present generation so it acts as a sort of bridge between the sixties and the modern day. Again there is a bigger pic on my Flickr page which is here. I produced several textures for this room and I will try and post a collage of them later. 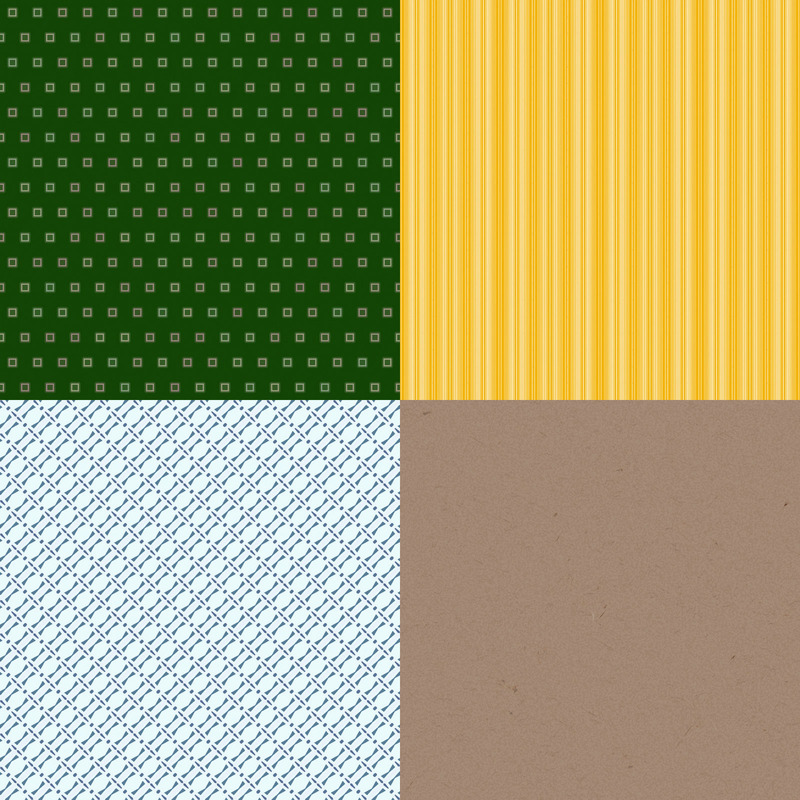 These are four of the textures I used to create the midcentury apartment image posted today. Each of them began life by being created with the excellent Filter Forge program.